Last week, President Donald Trump withdrew the United States from the Paris agreement on climate change. We are now in the company of only two other major countries — Nicaragua and Syria — that are not a part of the agreement. This may be a political move by our president, but for many of us who have been working in the built environment, it's personal. As an interior designer, I have always believed what we put into our building influences our well-being. By choosing finishes, furniture and lighting that are sustainable, we are increasing our chances of having a better quality of life inside our buildings. Keeping in mind that air and water quality are essential to all of us regardless of where we live or work, having a sustainable climate outside of our buildings is important to the climate inside of our buildings. Most conscientious designers and architects already know that designing sustainable environments is no longer an option. We don't need to be reminded about sustainability because it's part of who we are. We know the products we use to create the spaces we envision make a difference. We want our built environments to survive long after we do, and we want the spaces we design to enhance the geographic location by keeping it intact. Most of us are not radical environmentalists, but we are good stewards. We understand that we have been given the opportunity to create a man-made structure that should enhance, not destroy the existing landscape. Many of the manufacturing partners we work with feel the same way. We applaud our manufacturers who make real changes to their processes and show us that for them, too, this is a personal not a political issue. 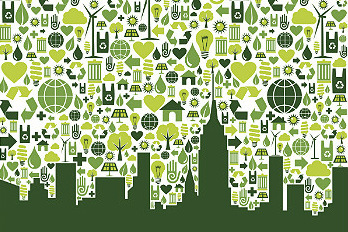 Since 1993, many design professionals have made the commitment to create a green environment. The United States Green Building Council has led the way by establishing LEED (Leadership in Energy and Environmental Design) certifications for governments and business owners to commit to a sustainable environment. I believe that everyone who lives on this planet has a responsibility to keeping it alive and well, no matter what you do. It is a personal choice that many have made long before there ever was LEED or the Paris agreement. As local city and state governments take on the political issues of climate change and address the impact it has on their communities, I hope that as you are reading this, you too, see just how personal this is. Designers and architects are the creators of the built world we live and work in. We — along with the millions of other industries that make, build and utilize our natural resources — need to take on that responsibility. We need to ensure that what we select, produce and install has all the right elements to promote a sustainable future. Supporting the efforts of those who are working hard to keep our planet healthy is what will sustain us — not political mandates. This isn't something we can negotiate for a better deal. We need to put aside our insistence that we are being treated unfairly on the world stage and do what Americans have always done and lead the way. As an industry, we need to show the importance of the environmental regulations that are now in place to benefit our health, safety and welfare. Keeping sustainability and the environment in mind for a healthy earth also insures that we humans will be healthy. If we keep ignoring the signs we see on a global scale that our planet is suffering from the harm we humans naively are doing, we will lose the opportunity to save our planet. If we are to continue to have the quality of life we want, we need to let our political leaders know why we are taking climate change personally. We need to continue to be sustainable in all that we do and support others who are doing the same. So, no matter who is in charge, we as a design community can continue to make a difference.